As Laura Roslin endures chemotherapy in the Galactica's infirmary, she meets another patient, Emily Kowalski, who is near death. Roslin is dismayed that Emily relies on Gaius Baltar's radio broadcasts for comfort. Then Emily reveals that she never liked Baltar before, but now wonders if he is divinely inspired because his sermons echo a visionary dream she experienced. In this dream, as she journeyed across a beautiful river to join the spirits of her lost family, she sensed a caring presence that she calls God. Emily is no mindless zealot, but rather a smart, compassionate woman who has found faith despite a terrible situation. Roslin opens up to Emily, confessing her own fears about dying. The women's budding friendship is cut short by Emily's death, but new faith may grow from the spiritual seeds that Emily has planted within Roslin. Aboard the Demetrius, Helo's mutiny against Kara ends abruptly when Anders, defending his wife, shoots Gaeta in the leg. Shocked to their senses, everyone rallies to give Gaeta first aid, and Kara strikes a deal with Helo. Only 15 hours remain before the Demetrius loses its last chance to rendezvous with the Galactica and the human fleet. In that time, Kara, Leoben, Anders, Sharon and Jean Barolay will fly a Raptor to the location where Leoben claims that a Cylon baseship waits to meet them. If they don't return before the clock runs out, Helo and the Demetrius will Jump back to the fleet without them. Kara's team finds the single surviving baseship adrift amid the wreckage of a terrible battle between the Cylons. The scene matches Kara's visions exactly. After a dangerous brush with leftover ordnance in the battlefield, Kara's team boards the baseship. There, the Eights greet their sister Sharon while Anders conceals his secret fascination with his kindred and their technology. The Cylon called Natalie reluctantly accepts the conditions of the human-Cylon alliance that Leoben proposes: Kara will visit the ship's hybrid while the Cylons use the Raptor's systems to supplement their damaged F.T.L. drive. The deal is threatened but not destroyed when old hostilities flare up between Barolay and another Six in a confrontation that leaves both women dead. Kara finally visits the hybrid, but the words of the mysterious being sound like nonsense. Soon, the hybrid must be taken offline to complete the interface between the baseship and the Raptor, but when the Cylons attempt to do this, a Centurion, acting as if the hybrid is under attack, shoots an Eight. - Why isn't Hera's blood being used to help cancer patients anymore? - Nana Visitor, who plays Emily in this episode, played Kira in Star Trek DS9. - Hybrid utterances: "All these things it wants and many more. Not because it wishes harm but because it likes violent vibrations to change constantly. Then shall the maidens rejoice in the dance. Structural integrity of node seven restored. Repressurizing. The children of the one reborn shall find their own country. The intruders swarm like a flame. Like the whirlwind. Hopes soaring to slaughter all their best against our hulls. Replace internal control accumulators four through nineteen. They'll start growing ripe on us pretty soon. Compartmentalize integrity conflicts with the obligation to provide access. FTL sync fault uncorrected. No ceremonies are necessary. [...] Then shall the maidens rejoice at the dance. Structural integrity of node seven restored. Repressurizing. The children of the one reborn shall find their own country. End of line. Reset. Track mode monitor malfunction traced. Recharge compressors. Increase the output to 50%. All these things [...] assume the relaxation like the photons in the central atmosphere is constant [...] transverse contact is inevitable leading to information bleed. FTL sync fault uncorrected. No ceremonies are necessary. Centripetal force reacts to the rotating frame of reference. The obstinate toy soldier becomes pliant. The city devours the land. The people devour the city. [...] But you are a spark of god's fire. Core update complete. [...] Threat detection matrix enabled. Dendritic response bypassed. The received dose is altered by the delayed gamma burst. Going active. Execute." - Helo attempting to arrest Kara. - Kara's raptor jumping into the debris of a Cylon basestar. - Gaeta pleading to Helo to not let Cottle take his leg. - Kara seeing her prior vision of the comet, only to discover that the comet was a Cylon basestar. - The raptor docking with the Cylon basestar. - Athena encountering the other eights. - Six regarding allowing Kara access to the Hybrid: "We've tried to be patient with your model's obsession with this woman. Playing house with her on New Caprica was one thing. But this puts us all in jeopardy." - Anders reaching for the basestar controls. - One of the sixes accidentally (in a manner of speaking) killing Barolay. - Anders assaulting the Six who killed Barolay. - Six forcing Anders' hand to kill the other Six. - Kara encountering the hybrid. - The centurion killing the Sharon which attempted to unplug the hybrid. - Cylon hybrid to Kara: "Thus will it come to pass. The dying leader will know the truth of the opera house. The missing three will give you the five who have come from the home of the thirteenth. You are the harbinger of death, Kara Thrace. You will lead them all to their end. End of line." - Six interpreting the words of the hybrid. Faith is (obviously) the episode's theme, featuring multiple characters having their faiths tested. Kara's faith in Leoben, Helo's faith in Kara, Adama's faith in Kara, etc. Roslin, thanks to Emily, is starting to see some validity in Baltar's newfound faith, or at least less invalidity in it. Ultimately this episode's strength is not in its theme, but in the developing Cylon plot. The lame cliffhanger of the previous episode is overcome quickly with the Demetrius CIC rapidly becoming a contentious and violent battleground resulting in Gaeta's leg a casualty. The compromise reached to send a raptor to the Cylon ship is imaginative and clever; definitely something that seems an unlikely proposition until the attempted mutiny. Why would it cross Starbuck's mind until she had to start thinking of a backup plan? The arrival at the basestar has mixed issues. On one hand, the stroll through the debris field is fun and the connection to Kara's vision and painting is well done. On the other hand, the whole plot surrounding Barolay's death along with the death of her murderer seemed unnecessary. The leader of the Sixes well establishes from her earliest lines that any sort of trust between the two peoples must be earned. Permanently offing one character on each side through what is basically an accident seems narratively superfluous. There are better ways to demonstrate an earned trust. An interesting side note regarding that digression is it allowed Athena to utter a rather interesting line to Kara. She said to Kara, regarding the Six killing Barolay: "she kills one of us and you're willing to just let it go?" Athena's statement implies that she in all contexts considers herself one of the colonials, something that is certainly consistent with her behavior recently. But still, an interesting thing for her to say in front of a bunch of Cylons. The plot thickens most regarding the Cylon hybrid's dialog with Kara, in which Kara finally gets to hear the statements that the first hybrid divulged to Kendra Shaw. That, along with Leoben's constant assurances to Kara that she's special and different from the others (such as his line claiming that she's "one of the few"), along with her seemingly supernatural return from death at the beginning of the season all point to there being much more to Kara than anyone really knows. We know all this already, of course, but what's interesting is Kara seems to know everything we do now as well which spells an interesting twist in the character's journey. As previously stated, I was less impressed with the title theme of the episode. While the consistent overtones of faith across all plot threads imbues the episode with a certain attractive symmetry, Roslin's story simply flopped. As a Star Trek fan, I welcomed Nana Visitor's cameo, but Emily's character didn't resonate well with me at all. It appears as though she served little more than as a plot device to get Roslin to pay more attention to Baltar's ramblings. I find it hard to believe Roslin would see something supernatural in having a dream which she, herself, admitted was common among cancer patients, especially after having had that dream described to her in great detail just prior to Emily's severe attack and lapsing into unconsciousness. It's obvious the entire experience was a powerful one for Roslin, so it's completely reasonable she would reenact the dream described to her. Instead, the first thing Roslin assumes is that it's all, somehow, related to there possibly being truth to Baltar's theological message, which, by her own admission is a message in support of the Cylon god; a concept she utterly despises, as she utterly despises the Cylons. On the other hand, Roslin made a big point about religion being metaphorical to Emily, which seems inconsistent with her stated belief as of latter season 1 that she believes the Kobolian scriptures to be all real. Maybe Roslin doesn't know what to believe. Given her nature as a dying cancer patient whose purpose in life as the dying leader has recently been called into question by Adama, it's reasonable to cut her a certain slack when dealing with her ever flip flopping position on faith. Aside from all that, one wonders why there's still no mention of blood transfusions from Hera. It's possible to rationalize Roslin's condition away as "maybe it only works once" or "maybe she just doesn't want it this time because she's supposed to be the dying leader" or whatever. But Emily? Why would she refuse such a treatment? I'm sure there's a rational explanation for why Hera isn't being used as the wonder-drug-kid across the whole fleet, but some sort of exposition regarding this would be appreciated. 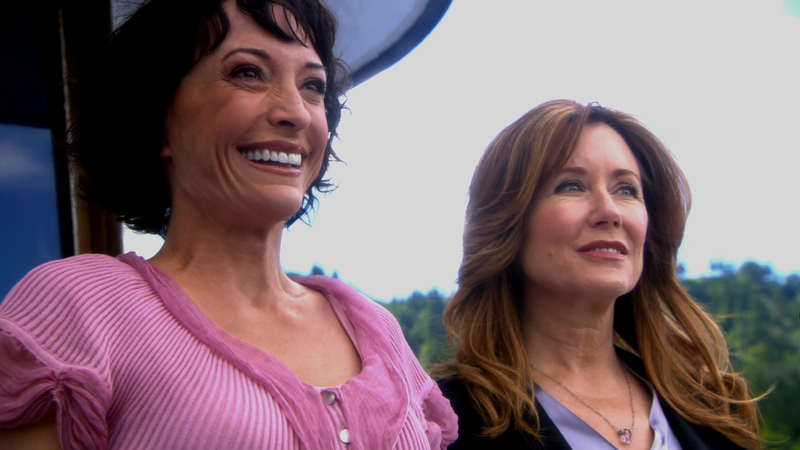 Instead, we're treated to what was largely an entirely unnecessary plot thread surrounding Roslin in this episode, climaxing in the wholly unnecessary final scene in the episode in which Adama declares that Roslin made him believe in Earth. Yeah, no kidding? I think we knew that since Home, Part 2. In the end though, the story of Starbuck and her crew beginning to forge an alliance with the Cylons was sufficiently well executed to raise the quality bar of the episode above average. The reason why Hera's "blood" wouldn't work anymore is that it wasn't simply a "blood cure" but rather a stem-cell cure that made Roslin's cancer go away in "Epiphanies". Since Hera is no longer a fetus or newborn her blood no longer contains stem cells and is therefore not able to provide a cure. In Epiphanies they used the term "blood" instead of the originally scripted "stem cells" to keep it simple. I agree that the Roslin part of this episode was a waste of time which could have used in a better way.